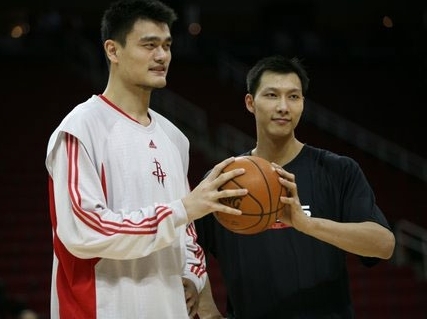 Yao Ming and Yi Jianlian faced each other for the first time in an NBA game on Friday night in Houston. 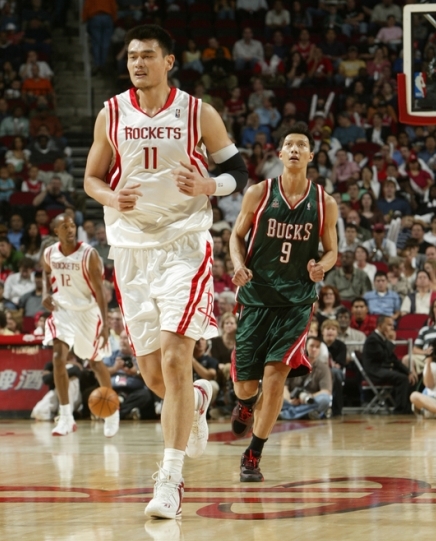 Yao got the better of his protege, leding the Rockets to a 104-88 win over Yi’s Milwaukee Bucks. Click here to see more photos from the game. With the enormity of the viewing audience for the Rockets-Bucks game on Friday night (for obvious reasons), it’s almost impossible to write anything here worthy of matching the size of the Yao Ming and Yi Jianlian fan base in China. But I’ll try my best. Watching the game, it felt a lot like a playoff atmosphere (try a few Super Bowls all rolled up into one) and you could sense that both Yao and Yi felt the eyes of the world on them. I guess Yao was a little nervous, only hitting 1-of-6 shots in the first quarter, most of them around the rim, including a missed dunk that caromed out of bounds. But as much as Yao struggled on offense, he was very good on defense, coming up with 2 blocks in the first quarter and numerous intimidations. He also didn’t foul that much, never getting in foul trouble, and finishing the game with only two personals. Our Raymond has translated an interview from Titan Sports of Yao Ming and Yi Jianlian before tonight’s big game in Houston between the two Chinese countrymen. 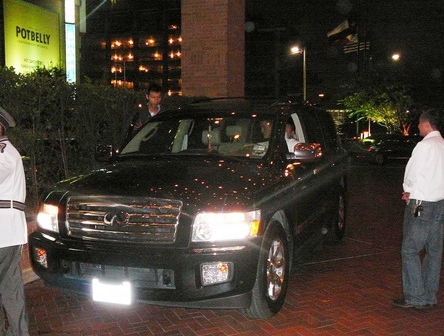 In the photo below, Yao is seen picking up Yi on Thursday night at the Houston Four Seasons to go to dinner. The interview questions were asked separately of both players, and they meshed the responses into one article. Yao Ming and Yi Jianlian have never donned different jerseys and confronted each other in any regular basketball competition. But now the time has come for that to materialize. November 10, 2007. Houston Rockets versus Milwaukee Bucks. Those experiences of playing against each other in team scrimmages of the national team suddenly become meaningless, because this is going to be a NBA regular season game, a genuine match-up. So right before the clash of the titans, Titan Sports conducted the following interview by asking the same questions to the 2 of them (at different locations). TITAN: What do you most want to say to him when you meet him on the court? Yao Ming: Watch out for Uncle Mutombo’s elbow. HA HA HA…..
Yi Jianlian: (After pondering for a long while) Long time no see. It finally happened…click here for the story. In case you missed it, here’s a great piece on Yi Jianlian on SI.com. He’s much farther along with his English and getting accustomed to American culture than Yao Ming was at the same stage. Here’s a good article about how Orlando’s Dwight Howard thinks Yi Jianlian can survive his rookie year. Looks like Boston is going to take Yi Jianlian with the fifth pick in the draft if he is available. Click here for the story. Yi Jianlian won’t be working out at an NBA pre-draft camp in Orlando, and this article in the Sacramento Bee seems to skewer him for it. However, at the end of the article, the Bee says that 19 other players won’t be playing either — just taking physicals. But it makes good headlines to say a Chinese guy is trying to hide something in his game. Just in case you missed it, ESPN wrote an article on soon-to-be-lottery-pick Yi Jianlian a few days ago. Here’s a link to it, although to read the whole thing you need to be an ESPN Insider subscriber. At least there are 2 videos on the page you can view for free. You are currently browsing the archives for the Yi Jianlian category.